The options on the Editor Format tab of the Visual Basic Editor (VBE) Options dialog, box shown, here enable you to customize the way VBE looks. Change VBE’s look with the Editor Format tab. 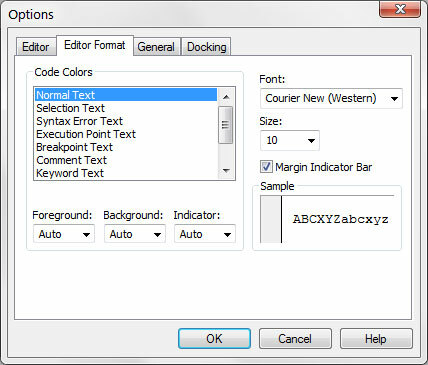 The Code Colors option lets you set the text color and background color displayed for various elements of VBA code. Most Excel developers stick with the default colors. But if you like to change things up, play around with these settings. The Font option lets you select the font used in your VBA modules. For best results, stick with a fixed-width font such as Courier New. In a fixed-width font, all characters are the same width. This type of font makes your code easier to read because the characters are nicely aligned vertically. You can also easily distinguish multiple spaces (which is sometimes useful). The Size setting specifies the point size of the font in the VBA modules. This setting is a matter of personal preference determined by your video display resolution and how good your eyesight is. The Margin Indicator Bar option controls the display of the vertical margin indicator bar in your modules. You should keep this option turned on; otherwise, you won’t be able to see the helpful graphical indicators when you’re debugging your code.